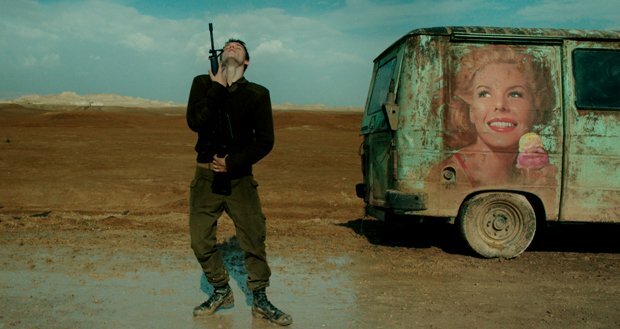 Eight years after his blistering debut Lebanon, which expertly expressed the horrors of warfare from the confines of a single tank, Israeli director Samuel Maoz is back in similar narrative territory. Although he widens out the action, Foxtrot is no less claustrophobic an experience as it explores how the shockwaves of military service can devastate entire families. Split into three distinct sections, the first follows married couple Michael (Lior Ashkenazi) and Daphna (Sarah Adler) as a soldier arrives at their apartment with news that son Jonathan (Yonathan Shiray) has been killed 'in the line of duty'; their slick and rather aggressive delivery suggests they have done this many times before. The second flashes back to follow Jonathan in the days leading up to the incident, while a third rejoins his parents in the aftermath. Reteaming with Lebanon cinematographer Giora Bejach (who also shot Israeli horror Big Bad Wolves), Maoz again demonstrates he is a master of visual storytelling. Carefully considered framing perfectly parallels onscreen emotions, from the overhead shots which track a shocked Michael pacing the disorientingly-patterned floor, to Jonathan's makeshift corrugated billet that's literally sinking into the mud. The incredible sequence which introduces Jonathan at his isolated outpost, as he dances the foxtrot under a vivid blue sky, using his rifle as his partner, will surely go down as one of the most memorable of the year. It's also a sharp juxtaposition to the muddy greys of his interminably dull everyday life; this middle sequence falls into such intentionally bleak repetition that, despite being entirely expected, the turning-point event is cataclysmic in impact. Indeed, while Foxtrot plays as something of a comedy of errors, it also makes some biting political points. Conscription means that Israel's youth spend their formative years in military service, often undertaking inconsequential duties, and their families live in a state of constant worry; the film's off-kilter lines underscore the central themes of absurdity, oppression and innocence lost. Screening on Wed 11 and Thu 12 Oct as part of the London Film Festival 2017. General release TBC.